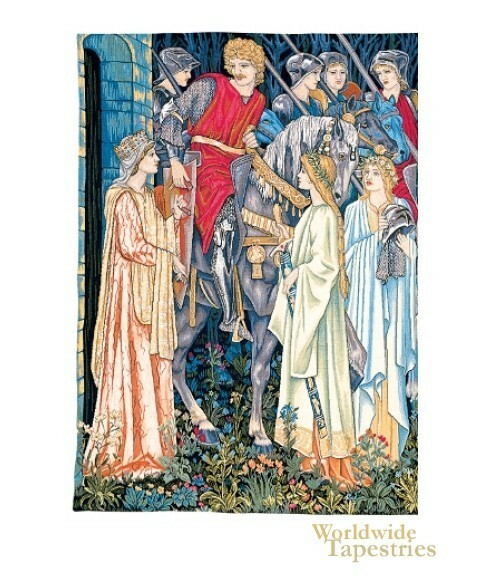 This tapestry is a detail based on the original tapestry, from a series of 6 tapestries depicting the Holy Grail adventures, commissioned by William D'Arcy, and woven by Morris and Co between 1895 and 1896. Here we see the departure of the knights of the Round Table, including Sir Bors, Sir Percival and Sir Galahad. The ladies of the court assist in handing them their helmets, swords and shields as they bid them farewell and luck. The blue grey forest woods and the more colorful forest flowers on the forest floor represent the darkness into which they depart yet the glimmer of hope that they are searching for in the Grail itself. This tapestry "The Holy Grail (Left Panel)" is backed with lining and a tunnel for easy hanging.